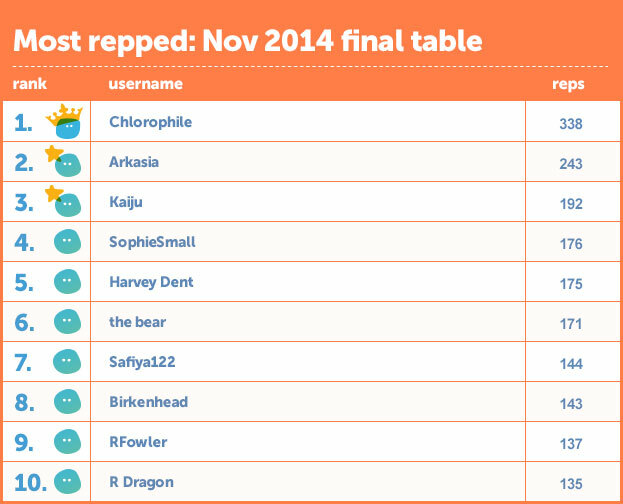 Congrats to Chlorophile for coming top of the November league table. Who's making the wittiest, most interesting, most helpful posts on The Student Room right now? That's what this new feature is going to find out. The whole point of TSR is to talk to other people - to give them useful advice, to make them laugh, to make them think. And if you're making great posts, then people will give you rep (find out more about TSR's rep system). This chart, which I'll be updating twice a week, shows who has been repped the most times this month. It lists the total number of times you've been repped - not the total amount of rep points you've received. It's that way round so that helping out a newbie on their first thread is just as valuable as being repped by one of TSR's power users. So, how good are your posts? Can you make it into the top 10? And if you do, can you reach the very top? At the end of the month, the most repped member will be declared the winner. As well as the bragging rights of being crowned TSR's most interesting and helpful member that month, you'll get an added bonus. The community team will double the rep points you've earned in that month. There's only one rule: no setting up of dupe accounts to rep yourself. For one thing, it's horribly time-consuming and you've got better things to be doing. For another, we have an amazing data guru in the office who will check the winner's reps for any from dupes. Anyone who's been gaming the system gets a big smack with the ol' disqualification hammer. How do you spot a TSRian? Very, very, very good luck to whoever answers! Post your stories/memories of TSR! 14th place? Really? Not even top 10. I guess I still have never won anything. Congratulations to everyone who made the top 10! I am partial to witt, I must admit! *I bow my head* (as I'm not wearing a hat) thank you! But the question is; can I add it to my curriculum vitae, complete with post counts? Ha! I can see myself going far! Surely, it would be rep to post ratio. Or too much spare time on their hands! No-one's won anything just yet - I'll be updating this all through November, with November's winner announced on 1 December. Shame this wasn't around in October, I could've got in the top 50 at least, now all my witty/sarcastic/funny posting talent has gone. I am all over this. Actually annoyed I was out having a life last weekend and not winning the most minor victory on the internet. I would +Rep you for being accurate! Its ok, I'm just incredibly bitter. Do you want chips with that bitter? Why do TSR Pro users subscribe? What do you like about TSR compared to other forums? Free Lecture at Imperial College:“Thoughts on the Chinese Economy” on 12th Nov.